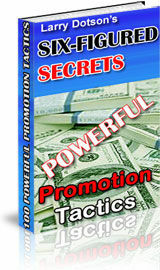 Description...Six-Figure Secrets: 100 Powerful Promotion Tactics! Example: Set up a joint venture with your competition if you can't beat them. You could agree to work together to beat the other competition then share the profits. For example, you could create a product together that you both could promote or you both could share advertising costs to promote your businesses together.